We have published three versions of this map, showing how the area developed across the years. Each has an introduction by Pamela Taylor, formerly archivist at the London Borough of Barnet. The maps each cover the same area, with the area known as East Finchley (formerly a hamlet called East End) on the east side of the map. This includes East Finchley station, parts of the Great North Road and Long Lane, and East End Road as far north as the Convent of the Good Shepherd and the Manor Cottage Tavern. The 1894-1911 and 1939 maps include much of Hampstead Garden Suburb, giving added interest. The 1894-1911 map is taken from the fascinating Special Edition, 'Partially revised in 1911 for Inland Revenue Purposes'. This uses the 1894 revision, but building since then to 1911 has been added; as later buildings are not hatchured it is easy to see how an area has developed over those years. If you have not seen one of these Special Editions, I can recommend them. 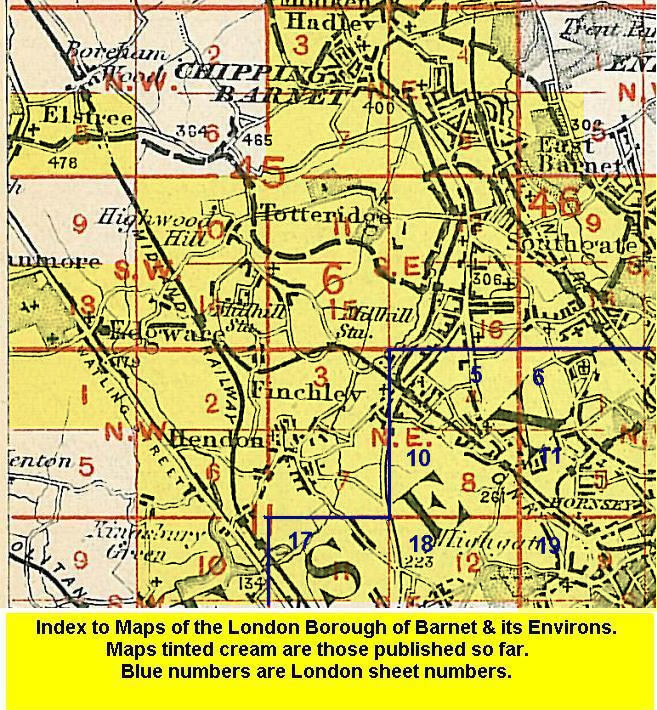 The map links up with London Sheets 5 Mid Finchley to the north, 11 Muswell Hill to the east, and 18 Kenwood to the south; and with Middlesex Sheet 11.07 Hendon to the west.